In the garden of the hotel Bedřiška is situated the depandancy, which is about 50 m far from the main building and which is connected with the hotel with a illuminated pavement. The whole hotel komplex find itself cca 8 min. far by walk from the town centre and from the sportsareas cca 10 min. by walk or you can use the skibus, which is free of charge and the skibus stop is directly by the hotel. 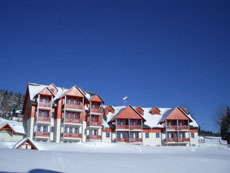 We introduce newly-built complex of apartments situated in popular touristy centre of our highest mountains. The apartments Horni Misecky are located in the beautiful mountain area of Krkonossky narodni park (Giant Mountains National Park) 1035 metres above sea level. 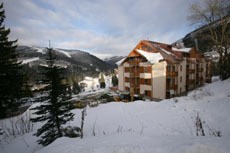 They are situated in immediate proximity of downhill runs and cross country tracks of Ski-resort Spindleruv Mlyn. Privát Gašparíkovi is situated directly in the centre of Špindlerův Mlýn. Because of its good position, is it a ideal base for rambles and hikes in the sommer and in the winter also. About 80m far from the pension is a ski bus stop and the bus will take you to both ski areals (free of charge) or 15 min. walking distance.